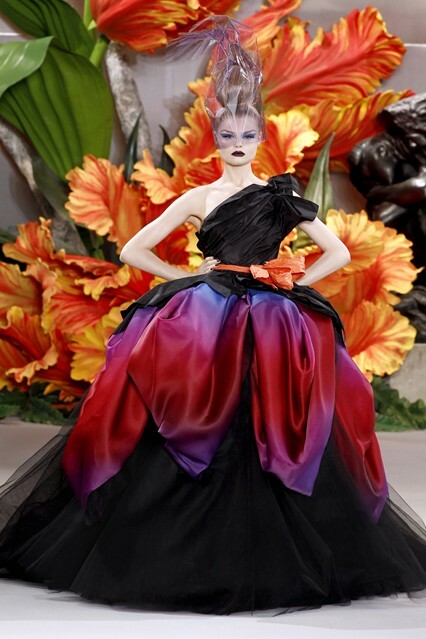 Nick Knight’s color-saturated flower pictures have inspired the Dior by John Galliano Couture Autumn/Winter 2010-2011 Collection, titled « The Floral Line / La Ligne Florale ». Other Nick Knight-influenced collections : Preen Resort 2013 (Justin Thornton and Thea Bregazzi drew inspiration from Nick Knight’s photographs of flowers), TSE Pre-Fall 2014 (Nick Knight’s 1997 portfolio of dried flowers, called « Flora », was the starting point of this collection). Une féerie se dégage de cette tenue, que l’on dirait sortie toute droite d’un conte de fée ! ♥ J’adore ! Wow, I’m loving all the colours! So gorgeous and eye-catching! Thank you ! This gorgeously eye-catching look is intoxicatingly beautiful !